This really pretty Shell Pink 6 Part Venetian Serving Tray was made by Jeannette Glass from 1957 to 1959. This Tray measures 16 inches long X 10 1/4 inches wide X 1 1/2 inches high. It is in very good condition with no chips, cracks or scratches. Be sure to search our other Shell Pink available. We guarantee items to be as described. THANK YOU. 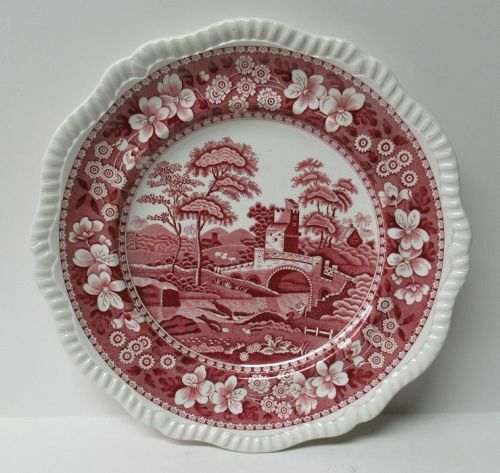 This is a really pretty pink (dark pink) Spode's Tower 10 1/2 inch china Dinner Plate. 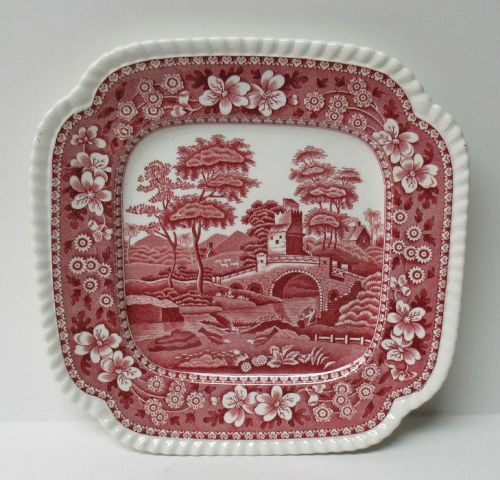 This Plate is signed on the back COPELAND ENGLAND - SPODE'S TOWER. This is the older stamp. This Plate is in very good condition with no chips, cracks, scratches or crazing. We guarantee items to be as described. THANK YOU. This is a really pretty dark green Moon and Stars 5 Inch high Syrup Pitcher, with Chrome Lid, made by Smith Glass. This Pitcher is in very good condition with no chips or cracks. The original Chrome Lid is in very good condition with no dents, scratches or damage. It slides open and shut freely. Be sure to search our other Kitchenware items available. We guarantee items to be as described. THANK YOU. 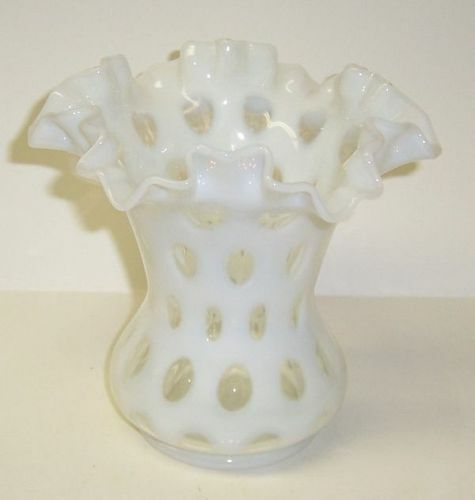 This is a really pretty White Coin Spot 6 1/4 inch high Ruffled Top Flower Vase made by Fenton Glass. This vase measures 6 inches in diameter across the top and is in very good condition with no chips, cracks or cloudiness. Be sure to search our other Fenton Glass available. We guarantee items to be as described. THANK YOU. This is a really pretty pair of topaz yellow Baroque Flame 5 1/4 Inch high single Candleholders Candle Sticks, Pair, made by Fostoria Glass. 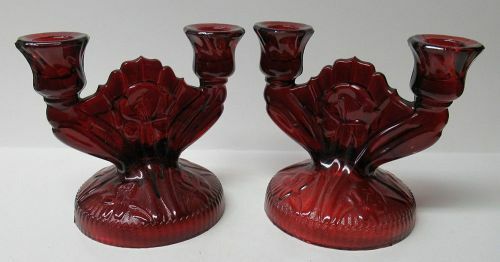 Both Candleholders are in very good condition with no chips, cracks or scratches. Be sure to search our other Fostoria elegant glass available. We guarantee items to be as described. THANK YOU. This is a really pretty green Windsor Diamond 5 3/8 inch diameter Deep Cereal Bowl made by Jeannette Glass from 1932 to 1946. This Deep Bowl measures 2 3/4 inches high and is in very good condition with no chips, cracks or scratches. This Bowl can be hard to find. Be sure to search our other Windsor Diamond available. We guarantee items to be as described. THANK YOU. 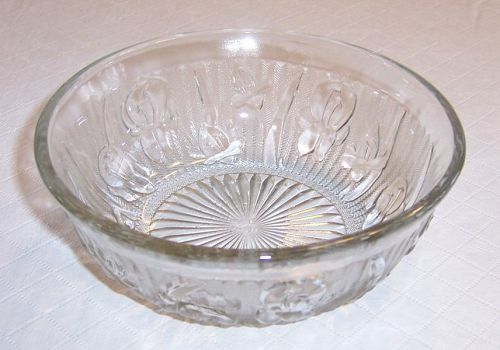 This is a really nice crystal clear, vintage, Iris and Herringbone 5 3/8 inch diameter straight sided Cereal Bowl made by Jeannette Glass into the 1930s. This Cereal Bowl measures 2 3/4 inches high and is in very good condition with no chips or cracks. This bowl can be hard to find. 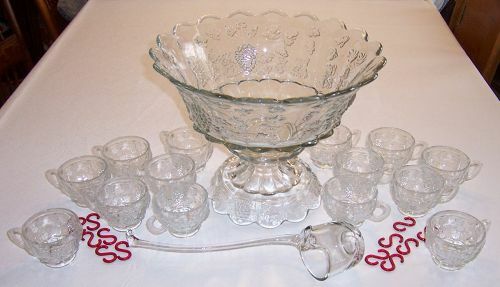 Be sure to search our other vintage Iris and Herringbone depression glass available. This is a really nice Forest Green Whirley-Twirley 9 inch high Water Pitcher with Ice Lip made by Anchor Hocking from 1953 to 1976. This Pitcher holds 86 ounces and is in very good condition with no chips, cracks or scratches. Be sure to search our other Anchor Hocking glass available. We guarantee items to be as described. THANK YOU.